What Is the Meaning of Golf Handicap? Golf handicaps create a level playing field for golfers of all skill levels. All golfers have different abilities based on their innate athletic talents, the length of time they have played and on their efforts to improve. At any time on the course, excellent golfers can find themselves playing with golfers of much less ability. A golf handicap makes an allowance for different golf abilities, giving golfers of all skill levels the ability to compete fairly. The function of a golf handicap is to allow golfers to compete equitably. 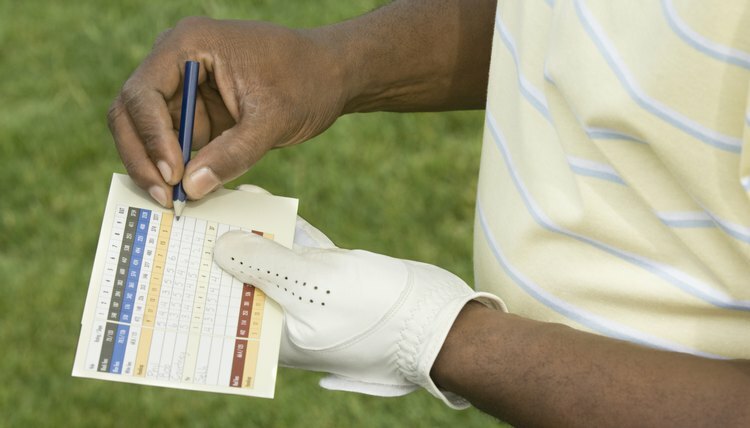 Each golfer turns in a scorecard after every round of golf. These scorecards are cataloged and the golfer is given a handicap index score. This handicap index is used to adjust the number of strokes that are required on each hole to score par. For instance, four strokes may be a par for an excellent golfer on a certain hole while the golfer of less ability will require five strokes to make par. This allows the golfer with less ability to compete more equally with the excellent player. Generally, golf handicaps are based on having at least 20 scores submitted. The best 10 scores of the last 20 rounds are used to compute the handicap. Golfers must have a minimum of five 18-hole scores or 10 nine-hole scores to be assigned a handicap. There are some considerations when discussing golf handicaps. First, all golfers are expected to attempt to play their very best golf on each outing. If a golfer were to play at a lower level than his capability, his handicap would be higher and give him an unfair advantage. Additionally, golfers who score significantly lower in tournament play than in regular play can have their handicaps reduced. Golf handicaps allow all players to compete with one another. Without a handicap system, the most physically talented and youngest golfers would consistently win all competitions. Golf is a sport designed to include nearly everyone, and a handicap system allows each golfer to fairly compete in tournaments. There are other types of handicap systems. These are usually designed to include players who do not have a handicap established. The Callaway system uses a chart to determine the golfer's handicap for that day. The chart is based on the number of high-scoring holes played by the golfer. The more high-scoring holes, the higher the handicap. Another system is the Peoria system. This system uses six preselected holes that are secret to the golfers. The scores on these holes are placed in a formula and used to determine the daily handicap. What Is a B Handicap in Golf? What Is a Handicap Hole on a Golf Course? What Is an Amateur Golf Handicap? What Does Handicap Mean in Golf?